Please contact Titanium Consulting using one of the links on this page or in the footer. Over the next two years a set of new Regulations will come into force affecting the transportation of dangerous goods by road, rail, sea and air. 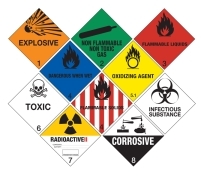 These Regulations, which flow from the United Nations’ (UN) Recommendations on the Safe Transport of Dangerous Goods, will introduce major changes. The 2009 text of the European Agreement Concerning the International Carriage of Dangerous Goods by Road (ADR), along with its rail equivalent the RID (Regulations Concerning the International Carriage of Dangerous Goods by Rail), will be fully implemented in the UK on 1 July 2009 by the Carriage of Dangerous Goods and Use of Transportable Pressure Equipment Regulations 2009. These Regulations implement the RID/ADR changes, except where the UK has negotiated derogations. Both ADR and RID are mandatory for international carriage between European countries and govern the carriage of dangerous goods by road and rail in Europe. The EU Framework Directive on Inland Transport of Dangerous Goods means that these Regulations are also mandatory in EU Member States for domestic transport. Among changes affecting both road and rail are new provisions for the transport of goods packed as limited quantities (LQs). LQs refer to small dangerous goods combination packages: aerosol cans in a fibreboard box, as delivered to a retail outlet, for example. These can enjoy relaxations from the full application of the rules because the risk is lower due to the smaller amount of product per package. From January 2011, there will be changes to the carriage of dangerous goods packed in LQs, including new placarding requirements for transport units over 12 tonnes tare (unladen) weight that are carrying LQ goods in excess of eight tonnes. Vehicles, wagons and containers conveying LQ packages will have to be marked with “LTD QTY”, or in accordance with the International Maritime Dangerous Goods (IMDG) Code if a sea leg is part of the journey. Failure to comply could result in prosecution of the operator. But this requirement only applies if eight tonnes of these LQs are carried on a transport unit with an unladen weight above 12 tonnes (and only if it’s not already carrying orange plates for full regulated dangerous goods). Consignors will be required to inform carriers of the total gross mass in advance, but a formal dangerous goods transport document won’t be required. Another related change is that excepted quantities (EQ) – which are even smaller than LQ goods, for example sample products – are now permitted in road and rail transport. This is the implementation of a change from the UN, and is based on traditional air regulatory practice. The sizes of package are similar to those allowed in air transport (inners max 30g/ml, outers max 1kg/l). Non-UN tested packaging is allowed if it’s marked with a red hatched EQ mark: if a transport document is carried then the fact that the dangerous good in EQ is being carried and the number of packages must be entered on the document. There will be a maximum limit of 1000 packages per transport unit. Tunnel codes reflecting the new tunnel restrictions in RID/ADR will now need to be entered on transport documents unless the route is known not to include any restricted tunnels. A very important change that applies just to ADR concerns instructions in writing, otherwise known as the TREMCARD or transport emergency card. Before ADR 2009, these instructions were supplied by the consignor and had to be made available in the main languages of the countries through which the vehicle would pass. As well as clarification of these instructions and confirmation that they are for the driver and not emergency responders, this four-page document must be kept readily available in the cab, and provided by the carrier instead of the consignor. Rather than reflect the main languages of origin, transit and destination, they must now be written in the languages best understood by the vehicle crew, which must be done before the journey begins. From 31 December 2009, Amendment 34 to the (IMDG) Code – which affects all sea transport of dangerous goods, both international and domestic (including deep sea, European ro-ro and domestic ferries) – brings some quite important changes. Marine pollutants will be classified for the first time, the upshot being that there will be no distinction made between “marine pollutant” and “severe marine pollutant”. All marine pollutants must now be indicated by a letter “P” in the dangerous goods list, or self-classified by the consignor in accordance with 2.9.3 of the Code.